If anyone has ever witnessed a Tonic Clonic seizure (aka Grand Mal) then they know how scary the event can be. It is the most active of seizures, and without getting too graphic, imagine pouring a bucket of water on a robot and the meltdown that ensues. Sparks flying, jerky movements, loud noises, you get the idea. It’s pretty much like that, however it’s a human being going through this. To sum it up, it is absolutely terrifying, especially when it’s someone that you love. Is when Hancy’s and my life changed . What started as an ordinary Sunday ended with Hancy in the emergency room. We were heading over to my buddy’s house to watch football and we stopped at the market for some beer. Hancy came out of the market and said that he almost passed out while waiting in line. I thought to myself, wow that’s weird. Earlier that morning he twitched a couple times and actually split milk all over the floor (that’s how violent these twitches were). So I pull out of the parking lot, head up the street and out of the corner of my eye I see him twitch again. I look over to be like “Dude, what is wrong with you?” and his whole body is rigid with his foot jammed in the dashboard, moaning, eyes rolling back and convulsing. I pull over and hop out of the car. Luckily there was a guy walking down the street (literally the only guy on the entire street) and I yelled for him to call 911. I had no idea what was going on. I go to his side of the car and eventually he stops convulsing (among other things) and then literally just slumps over. I honestly thought he was dead. I had never seen a seizure before and since he had no history of them I didn’t know what was going on or what to look for. I start to rub his heart and tell him to breathe. His eyes are rolled back into his head and the kid is not breathing. I am freaking out man! He starts spitting up and then all of sudden he starts trying to catch his breath and looks up at me. He’s looking at me, yet he’s not there. He can’t talk and his eyes are distant. I basically hold him steady and rub his arm until the ambulance shows up. 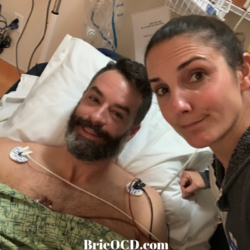 They take him to Scripps Memorial and after a bunch of tests and many neurology appointments later, the only thing they can come up with is that he was severely dehydrated and that drinking was the main cause of that. So he quits drinking and for months I take him to the required follow ups until the 6 months passes and he can get his license back. When you have a seizure in CA you automatically lose your license for 6 months (most recently they have shortened that time to 3 mths). Oh and did I mention on top of all this he didn’t have insurance?? Sheeeeiiitttttt. YOUTUBE VIDEO BELOW OR BY CLICKING HERE IF YOU RATHER WATCH THAN READ! 8 years pass with no incidents. Rightfully so, Hancy never gets drunk and if he has a couple of beers or glasses of wine he ALWAYS drinks a ton of water. That is, until Saturday December 15th 2018. The night before was his company Christmas party and both of us only had a couple glasses of wine spread over many hours. The next morning he went for a run and then met the boys at a couple breweries, again only having 1 at each brewery. Early evening we did our Beer Advent Calendar on FB Live (split one beer) and then headed to a friend’s party. I had a couple glasses of wine and Hancy drank a couple from the keg. We left around 10:30pm (that is LATE for me folks!) and went home to bed. Hancy gets up the next morning around 7:30 and I ask if he wants to go to church. He says eh, let’s skip this week. And something about the way he says it, I don’t push the issue. Instead I say let’s go up to Starbucks and take the dogs for a walk (they poop better up there lol) and he agrees. He’s getting their leashes on and I am still upstairs getting a gift card. Well not even a minute later he is back upstairs sitting on the couch. I am like… bro… what are you doing? We’re supposed to be getting coffee?? He says that he doesn’t feel good, that his belly and head feel funky. I am immediately taken back to 2010. It could’ve been yesterday the way it snapped back into my consciousness. I look for a twitch, anything to signify that a seizure is coming. Sure enough, a minute later his right leg bucks and I say I am calling 911. He tries to tell me to just drive him there and I am like HELL TO THE NO. Sorry, but I am not going through what I went through the first time! That was hands down the scariest thing I have ever had to witness, not again, NO. I call 911 but I am so frazzled I can barely find the keypad to dial the numbers. The call feels like it takes forever but the guy assures me that even though he is still asking me questions that the ambulance has already been dispatched. I am trying to just let Hancy lay there but I am freaking out man. 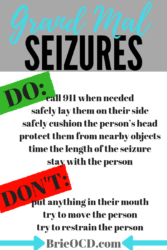 (see image above for what to do and not to do if you are around someone having a seizure). I am so afraid this beast is coming and I don’t know what to do. Mind you, the dogs are still down in the entryway with their leashes on and haven’t gone out since last night but I don’t want to leave Hancy alone. The paramedics show up (thankfully still no seizure) and I am trying to watch him, open the door for the paramedics and keep the dogs back (impossible to do all three when Hancy is upstairs). They come in and call out to Hancy to see that he is still coherent and Hancy decides to get off the couch and walk himself over to the top of the stairs. I yell for him to sit down but he is a wee bit slow and starts to descend down the stairs. He fumbles on the last step and the paramedic tells him to sit down. They start asking him some questions and since they are there to take care of him I decide to run the dogs to the corner so that I can follow them to the hospital. (still can’t decide whether that was a mistake on my part). I am literally on the corner with the dogs for I don’t know 2 minutes and by the time I get back he is full on seizing in the driveway on the gurney. They later tell me that he was seizing for 90 seconds. 90 seconds. A minute and a half. That is a long freaking time to be completely tensed up, rigid and basically melting down (also the reason his neck was killing him the next day). Damn. I talk to one of the paramedics and find out where they are taking him and then yell to him that I love him and he’s going to be ok. Again like back in 2010 the lights are on but nobody’s home. He’s starry eyed and looking dazed. I run inside, gather some belongings and head to the hospital. Once again, just like in 2010 all of the tests at the hospital are coming back normal. We end up at the hospital for about 5 hours and then head home. This time he seems much more alert than he did back in 2010. The only thing that I can possibly attribute that to is that the paramedics were there when he had the seizure instead of arriving 10 minutes after he was done. We schedule the necessary follow-ups (not without some grief) and he goes in for an MRI and EEG. MRI comes back clean (hallelujah) but the EEG comes back extremely abnormal. The neurologist explains in the time frame of 20 minutes he had severely abnormal activity (which usually in the short time of 20 minutes they don’t catch anything but this abnormality was clear as day) and they are diagnosing him with seizure disorder. I asked what the difference was between seizure disorder and epilepsy and she said the only difference was basically the frequency. Since he has only had two over the period of 8 years she doesn’t necessarily qualify it as epilepsy at this point. Next we talked about medication. Seizure medication is something that you have to take everyday, 2x a day for the rest of your life. (unless you get extended release pills then you only have to take 1x a day but those are insanely expensive). Many times people have to start on a secondary medication when the first isn’t sufficient. The neurologist explained that the pills are supposed to reduce your risk of having a seizure but that the meds don’t necessarily stop you from having them. She explained that at first they would have to play with the brand and dosage of medicine to find the right one for him and that alone could induce a seizure. Wait What?!?! The meds that you have to take 2x a day for the rest of your life might reduce your risk OR alternatively might actually cause you to have another one? And what did you say, oh that these meds come with a whole slew of side effects including but not limited to dizziness, nausea, headaches, coordination loss, drowsiness, weight loss, speech & coordination problems etc? I am not a doctor but for someone who has historically had a seizure once every 8 years the pros don’t seem to outweigh the cons. Not even close. I told Hancy that it was up to him as I wasn’t in his body and I didn’t know how he felt on a daily basis. He didn’t seem to sold on the idea of meds and asked about CBD oil. The neurologist said that he could try it out and see how he felt if that is the route he decided to go. She said that they actually are testing it on kids with severe epilepsy. 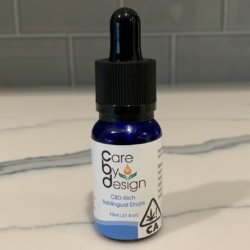 I was shocked that they were using CBD on children but not on adults. She explained that these children were severely disabled because of their seizures so they are a great test group because of the frequency and limited motor skills. We leave that day saying that we are going to discuss, weigh out the pros and cons and will get back to her. 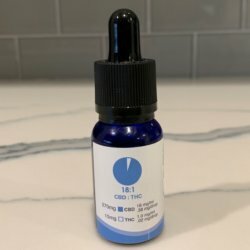 A couple days later we end up going to this dispensary near our house and grab some CBD oil 18:1 (18 parts cannabinoids, 1 part THC) and he has been taking it since the New Year. He is still not drinking and I am driving him to work everyday because he won’t have his license back for at least 3 months. (just call me Morgan Freeman…. Driving Miss Daisy anyone? LOL). At this point we are just taking this setback day by day and seeing how he feels and adjusting the oils accordingly. He has said he is feeling good but I know he is still in recovery mode after the episode. We just ordered some purer, more regulated product from Buddha Hemp that is 24:1 and I am excited to see how he feels after we get it in the mail. It is gi001 grade which is really high quality and basically the closest you can get to being FDA approved. (Enter discount code Brie15 for 15% off your total order!) If he doesn’t feel 100% in a month or so we will probably reconsider the medicine so that he can attempt to feel normal again . His health is obviously the most important thing to me so I will be there every step of the way. So let’s all say a non alcoholic cheers to Hancy’s health and hope that the CBD works its magic!! Do call for emergency assistance when needed. Do lay them on their side. Do safely cushion the person’s head. Do protect the person from any nearby objects. Do time the length of the seizure. Do stay with the person until they recover. Don’t try to move the person.